VISIT OUR EVENTS PAGE FOR DETAILS AND THE REGISTRATION FORM. New CASA Training Session, starts March 1, 2018! Mesilla Valley CASA is hosting a New Advocate Training Session in March. 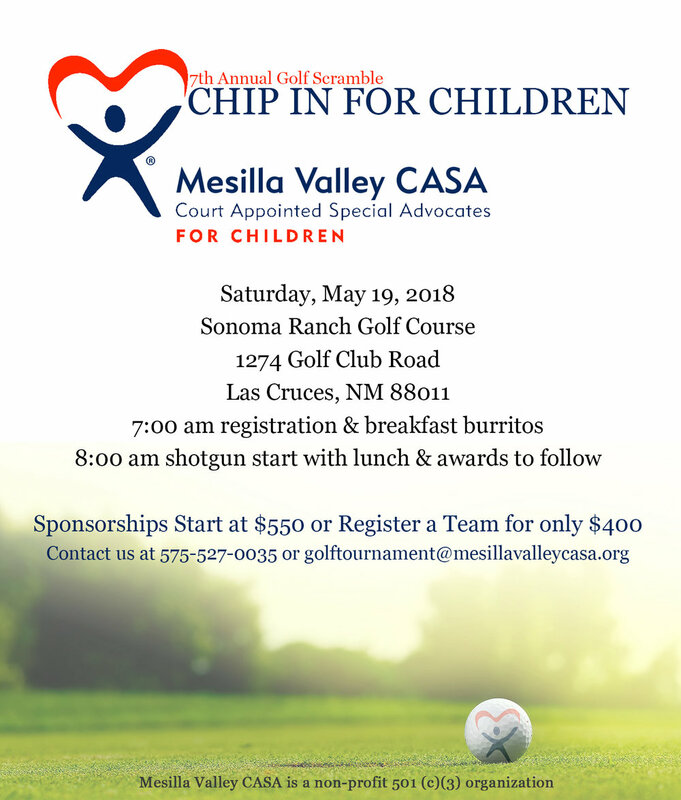 Learn how to advocate for children living in foster care in Dona Ana County, ensuring that they don't linger in the system. Find out how you can serve as the eyes and ears of the court. Day 1: Thursday, March 1st, from 5:30 p.m. until 8:00 p.m.
Day 2: Saturday, March 3rd, from 9:00 a.m. until 4:30 p.m.
Day 3: Thursday, March 8th, from 5:30 p.m. until 8:00 p.m.
Day 4: Saturday, March 10th, from 9:00 a.m. until 4:30 p.m.
Swearing-in: Monday, March 26th, from 8:00 a.m. until 12:00 p.m. Applicants then participate in Pre-service Training which consists of one evening session/orientation where we discuss the role and responsibility of CASA advocates; two full Saturday sessions where we discuss all aspects of child welfare, including the contributing factors to child abuse and neglect (poverty, mental health, substance abuse, lack of parenting skills, etc). Then, all applicants attend a swearing-in ceremony before the Children's Court Judge, where applicants take an Oath of Service to uphold the confidentiality of the cases. After new advocates are sworn in, they observe court hearings, and attend a luncheon with current volunteers. We are excited to share with you all that Mesilla Valley CASA is participating in Giving Tuesday this year. #GivingTuesday is a global day of giving fueled by the power of social media and collaboration. Celebrated on the Tuesday following Thanksgiving (in the U.S.) and the widely recognized shopping events Black Friday and Cyber Monday, #GivingTuesday kicks off the charitable season, inspiring people to take collective action to give back to their communities in new, meaningful ways. This November 28th, join the movement and give - whether it’s some of your time, a donation, a gift or the power of your voice in your local community. Donations made to Mesilla Valley CASA on #GivingTuesday will be used to provide holiday gifts to the foster children that we serve in Doña Ana county. Like our Facebook page and share #GivingTuesday with your family and friends! Taking applicants now for our new CASA training session in October! Mesilla Valley CASA is hosting a New Advocate Training Session in October. Learn how to advocate for children living in foster care in Dona Ana County, ensuring that they don't linger in the system. Find out how you can serve as the eyes and ears of the court. Day 1: Wednesday, October 18th, from 5:30 p.m. until 8:00 p.m.
Day 2: Saturday, October 21st, from 9:00 a.m. until 4:30 p.m.
Day 3: Saturday, October 28th, from 9:00 a.m. until 4:30 p.m.
Swearing-in: Monday, October 30th, from 8:00 a.m. until 12:00 p.m.